It’s better known as Teflon to the housewife who works all day in the kitchen and finds its non-stick quality to be a blessing. Little does she know that she is in danger of being exposed to Teflon Toxicity and what she calls a blessing is a slow poison acting on her system every time she uses it. Like her, there are many others who do not know the facts of Teflon Toxicity and today, Teflon and the chemicals used to produce it have expanded into a $ 2 billion industry. Teflon is comprised of a class of highly stable compounds used widely in commercial and industrial applications as surfactants, paper, textile coatings and food packaging. It is a man made chemical and not found naturally. Scientists know it is PFOA (Perfluorooctanoic acid). Today there is a growing concern over human exposure to PFOA. Recent studies have also shown that PFOA causes toxicity and side effects among laboratory animals. When considered that 95% of American find traces of it in their bloodstream, it becomes pertinent to reopen the dialogue for Teflon Toxicity and the dangers of using non-stick cookware. Teflon was invented in the 1930s by DuPont. Few years ago the company had to settle claims with residents who lived near the Ohio River (West Virginia). Their complaint was that PFOA had contaminated their water supplies. They alleged that the chemical was linked to causing birth defects and various other health ailments among their community. DuPont eventually agreed to pay $50m in cash to the plaintiffs and also agreed to spend $10m on special water treatment facilities to filter out PFOA. That was followed by an agreement from DuPont to settle matters with the EPA (Environmental Protection Agency) for having failed to disclose health data about PFOA for 20 years. “In retrospect, this may seem like one of the biggest, if not the biggest, mistakes the chemical industry has ever made,” comments Jane Houlihan (Vice President: Research at Environmental Working Group). “They’re in such a huge range of consumer products. We’re talking about Teflon, Stainmaster, Gore-tex, and Silverstone. So if you buy clothing that’s coated with Teflon or something else that protects it from dirt and stains, those chemicals can absorb directly through the skin,” she further states. According to the Environmental Protection Agency, some of the highest levels were found in children. Though the lawsuit with DuPont reached a settlement, the repercussions of this chemical cannot be taken lightly. Once taken into the human body, this chemical is slowly eliminated and not known to undergo biotransformation. In other words, the human body is unable to break it down into soluble form and it remains in the bloodstream. These traces accumulate but not like other organic pollutants. Instead, they bind to the vital organs like the liver and blood serum. Various adverse health effects have been observed in animal studies of PFOA, including tumors in certain organs and developmental delays. However, several studies in humans suggest that exposure to PFOA may also be linked with increased cholesterol in humans. In a more comprehensive study that included 4000 adults in the age group of 20 years and above, their blood samples were maintained from 1999 to 2006 for monitoring PFOA levels. The results indicated that those with the highest PFOA levels in the bloodstream were that much more prone to thyroid disease. This causes serious concern since the thyroid hormone system is vital for proper functioning of essential metabolisms like heart rate, body temperature, digestion and mental health. Our exposure to Teflon Toxicity through PFOA begins with a simple daily exercise. Whenever you heat your non-stick frying pan, it very quickly reaches the temperature of just over 200 deg Celsius. It’s at this crucial temperature that the coating begins to break down and toxic fumes are released into the surrounding air. As the temperature rises, so does the toxicity and once your frying pan crosses the 350 deg Celsius mark it has already released 2 carcinogenic gases, two global pollutants and a chemical gas that could prove fatal when humans are exposed to even low levels of it. It is further revealed that when our innocuous non-stick Teflon pan is further exposed to temperatures over 500 deg Celsius the coating will break down into a gas that was the equivalent of ‘phosgene’- used as a chemical warfare agent during World War II. Since we know that PFOA is released into the air we breathe and is not easily broken down or assimilated, it becomes important to reduce our exposure to it. Studies have shown that even if you remove yourself from any PFOA exposure surrounding starting today, it would still take your body 20 years to get totally free from it. After four years the levels of PFOA are reduced to half. Keeping that in mind it is best to keep exposure levels low to avoid Teflon Toxicity. 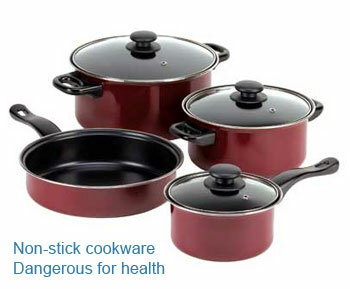 A good substitute is to opt for ceramic cookware instead of the more commonly used non stick variety. Not only is it more durable and easy when it comes to cleaning them, it is completely inert. In other words, it will not release any harmful gases or chemicals that would lead to toxicity in the body when exposed to high temperatures. One could also opt for glass cookware. Non Stick Teflon: Exposure to PFOA that leads to a wide range of problems discussed above. Aluminum: Being a reactive metal there is today a growing lobby that believes it could lead to debilitating diseases like Alzheimer. Stainless Steel: This metal has the capacity to leach into your food and lead to allergen complaints. Copper: For many this metal leads to discomfort and is recommended for majority to keep it away from making direct contact with food. It would also do you a world of good to avoid foods like French fries, candy bars, pizza, microwave popcorns or any other preparation that use non-stick coatings. Perhaps the next time you reach out for your non-stick frying pan or see something being cooked in it, keep in mind that you are being a victim of Teflon Toxicity and have the option to avoid it and opt for something better.